Fiji has been recognized for the sterling work on the rights based and inclusive approach to Fijians living with disabilities. 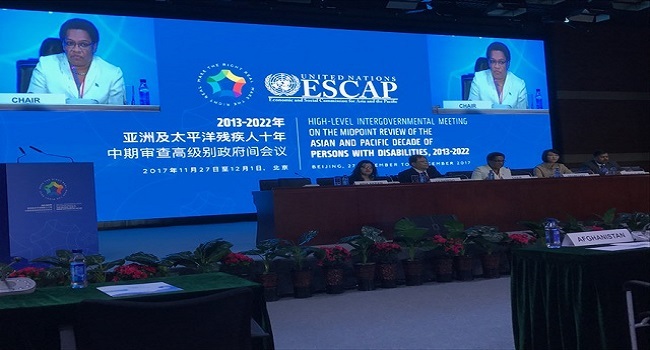 This is after Minister for Women and Children, Mereseini Vuniwaqa chaired a Senior High-level Intergovernmental meeting on the Midpoint Review of the Asian and Pacific Decade of Persons with Disabilities, 2013-2022 in Beijing, China. The midpoint review presents a good opportunity to take stock of the challenges and barriers that hinder the advancement to make a difference to the wellbeing and livelihoods of people living with disabilities. The result of the forum will assist in striving to build more inclusive societies at a time of global economic uncertainties, rising inequality, and the 2030 Agenda for Sustainable Development. This provides a unique opportunity to “leave no one behind” in development, and to support disability-inclusive development across Asia and the Pacific. The event which is organised by UN Economic and Social Commission for Asia and the Pacific with China’s Disabled Persons’ Federation will end on the 1st of next month.